In line with the General Data Protection Regulation (GDPR), which is in force from 25 May 2018, NEW DIPLOMACY is disclosing that we store the email addresses that newsletter subscribers have provided us to send emails about New Diplomacy events, news, and publications. New Diplomacy newsletters are disseminated by email when new information is added to the site (maximum of one newsletter per day). The only information we store is a subscriber's email address. This personal data is collected by a third-party provider, Google (Google Feedburner), which distributes mailings for us in accordance with data protection laws. Subscribers' data is not shared with any other mailing lists or third parties. We will never share your personal data with any third party, unless required to do so by law or with your consent. Consent has been collected by subscribers at sign-up for the newsletter, and the option to unsubscribe is included in all newsletters sent to their respective email addresses. Subscribers are able to opt-out of receiving communications anytime they wish by clicking unsubscribe at the bottom of our emails or by sending an email to news@newdiplomacy.net, upon receipt of which your email address will be deleted. The email addresses of subscribers are stored and kept safe with restricted access. Email addresses are the sole data stored. No other information about the subscriber is collected or stored. 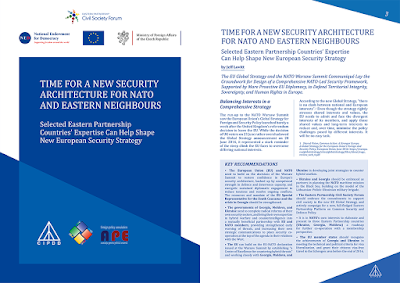 NEW DIPLOMACY was launched in 2015 to address the policy challenges facing global and regional policymakers in the eastern and southern neighbourhoods of the European Union, not least the insecurity in the post-Soviet space and the crises of democracy and instability in the Middle East. The founders are a group of policy analysts and media professionals, each with several decades’ experience leading projects in promoting EU integration and closer Euro-Atlantic relations, and in strengthening civil society in the post-Soviet space. NEW DIPLOMACY, z.s. is a non-profit association registered in Prague, Czech Republic.